Santa came early this morning and a Meade 10" RCX400 telescope showed up. I bought this used from a local bay area fellow. 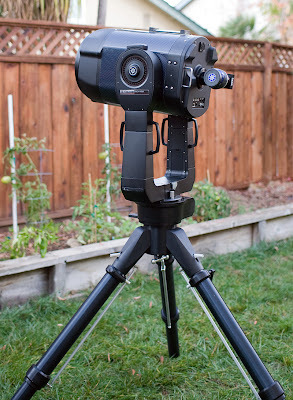 This evening, I quickly set it up (needed some help lifting with Kim) and did a very quick auto alignment and checked the optics. The tripod is seriously heavy and seriously solid. I am still surprised by just how sturdy it is. The OTA is very heavy (85lb compared to the 32lb of my 8" LX90). The combination of the optics, 10" aperture and 2" eyepieces make for a very pleasant viewing experience. I didn't test the tracking performance or Go-to performance since the transparency wasn't that great and I didn't want to run the scope for too long. I am planning on doing a bunch of preventative servicing before seriously using the scope, including replacing the plastic gears with steel ones, upgrading the RA clutch and installing Peterson handles. Technical Specs: Canon 1D3, 35L, f/2, 1/50s, ISO 800. Nice scope! That sounds like a serious piece of equipment there.